The banner at the top of this issue of The Flash touts “ALL NEW STORIES – BEST IN COMICS”, and, as it turns out, the hyperbolic hyperbola is pretty much on the money. The reason for this can be found in the diagonal (when you want to improve your design, make a part of it a diagonal – Design 101) banner at the bottom announcing that the Green Lantern/Green Arrow stories have moved over to The Flash! The Green Lantern book had been on a downward toboggan ride for a while at the point, and it became the Green Lantern/Green Arrow book when, in an editorial attempt to resuscitate it, Julie Schwartz had brought Denny O’Neil and Neil Adams in to spin some more modern tales… which they proceeded to do and then some. The work that team produced, as I’ve previously stated, inspired me on many levels, and has become a landmark in comics history. Every time I turn around DC is repackaging those stories for a new generation… with more expensive packaging. That being said, the GL/GA book still went in the tank. So they took the remaining story GL/GA and parked it in the back of The Flash. The Len Wein story that fronts the book does a nice job of pulling Iris’s father Professor West back into the fold with a story about a runaway computer. Arthur C. Clark once proffered that technology that isn’t understood can appear to magic, and, not understanding much about computers at that time (who did? ), Wein has his computers perform in magical ways by creating duplicates of the Flash. Maybe Wein was anticipating 3D printers. Whatever, it make for an entertaining if slightly goofy story. The GL/GA tale has Green Arrow accidentally kill someone, become so distraught that he calls his girl Black Canary to say goodby and ends up appearing to be killed in an explosion. The cliff hanger is brought on by the fact that they had to serialize a book length story to make it fit in The Flash. All in all, it helped to make this one heck of a comic book. And I missed it. 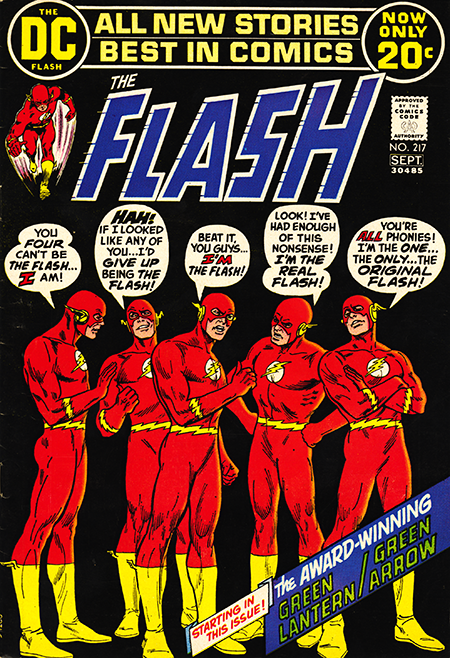 Somehow back then, on my comic buying rounds, I initially missed this issue and didn’t get ahold of it until I filled out my Flash collection because I really wanted to read the complete run, and in anticipation of launching this historic and folkloric journey through the Silver Age Flash. As previously noted, I was totally occupied by getting Funky off the ground and keeping it in the air, something that took practically every waking moment. How is that possible you ask? I know. Growing up I though that all you had to do was draw three pictures a day and then it was off to the golf course. Biggest disappointment of my life. In fact I actually live near a couple of golf courses and my dream is to still make it out to one of them someday. I don’t golf, but I would just like to sit by the first tee and watch people tee off for a morning. Who knows? Maybe someday.